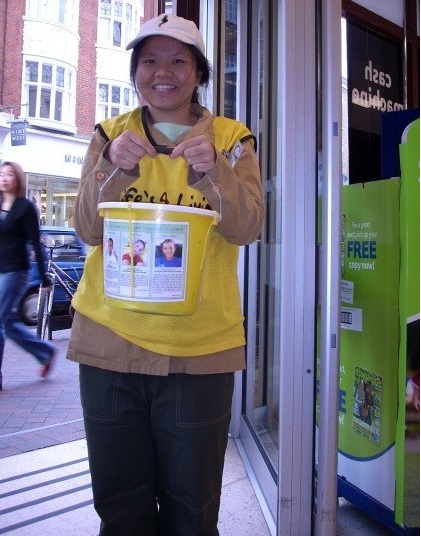 Curiosity and Testing on the Invention: The yellow container which I used to collect the money or fund donation is designed to avoid or disallow the volunteers to withdraw money or steal the money from the yellow container. I was curious to find out how the organization can prevent stealing, then, I tried all ways to withdraw all the money from the yellow container. I am amaze about the invention and I am respecting the inventor about his deep knowledge in Physics so that he can design such an invention. The designer worth to be a millionaire with good life. I was curious to do the testing on the stealing prevention invention and I was not stealing with no intention to steal, however, I was curious about the design, thus, I needed to test the invention by trying all ways to "steal" from your perspective. Do not misunderstood me without a fair trial. It is so unfair for me to carry this bad behaviour for years since you do not understand my education background. Multimedia University is a research university and I was a lecturer there with the education on product invention and innovation for a better research. I was in central London for the fund raising event about 10 years ago. I am holding the yellow container which is specially designed to avoid and disallow stealing from the volunteers. If you are always saying that you are smarter than me or you are very smart by well deserve to be rich with good life. Then, design this yellow container without looking at it and test it like me. Am I making sense that as a "Scientist" or a researcher like me, I should have the highest curiosity and enthusiasm about product invention and innovation. Not like a lot of "deep cheap" so called rich people who are only like to steal the design floor plan or blueprint about some new or existing product invention and innovation such as imitate designer Louis Vuitton (LV) bag, Burberry clothes, bag, shoes and many others without investing money in research and promoting design with invention and innovation to save the world. A lot of "deep cheap" employees and medical doctors are blaming that they work very hard and they deserve to have more money because they are the key person to run the business for the boss or the medical doctors think that they deserve to be rich because their academic results are better than one or many who rich easily without much hard work like me, the inventor of the stealing prevention yellow container or any fashion designers, scientists and researchers. Do not do anything funny to your employers and researchers like me with so much of ideas to save the world and provide job opportunities. You can compare while you must know how, why, what, which, when and many others factors which cause one to become rich. Of course, you can follow what they are doing while in this world and timing when you want to become super rich, you must have product invention and innovation. I may suggest that you go through all your education track again to ensure that you are good in your education tracks involvement by having the ability to solve problems or social problems. Do not look down at people who are sick or having/ involving in any social problem such as stealing, credit card debts, innocent drug abuse and many others. We should solve the problem and provide helps by highly promoting TALENTS ACQUISITION AND APPRECIATION. Australia and New Zealand are used to be prison for sinful people. Are you saying that you should avoid all Australian and New Zealand people since they are extremely hardworking and well deserve to have good life too? If they are sinful and they accept that they are wrong with correction and never do that again, why not we give them a better place to live. Of course, they must be punished if the social impacts are deeply influenced others to do bad or act like them. Let's visit Australia and New Zealand one day. The flight tickets to all these places are not cheap though. You could be a rejected item in the perspective of a person, a group or an organization while you must be a treasure of someone, a group or many groups and organization. This is the art of social economy, team work and business. You may find that buying a Burburry handbag in France or Italy is much more expensive than Asia. This is the art of business where Burburry will run sales events or they are respecting and promoting the art of fashion. I might be buying a fashion designer bag such as a Burberry bag which is 2 years after it was newly launched in Italy or France. Thus, it is much cheaper when I get it in Asia. In Asia, we rarely see perfectionists while Asian are good because they are looking for GOOD DEALS and GOOD BUYS. Tell you about my low knowledge in fashion a while ago. I wanted leather bags or some design which are attractive or extraordinary, well worth and good buy. I do not know what is Burberry, Coach, Micheal Kors, Kate Spade, Ted Baker, Nike, Fila and many others while their products are really beautiful and well design, you will not stop your grave to have their products continuously because they have a team of good designers who are really creative and innovative as well as the responsible and honest manufacturers to do the good job.